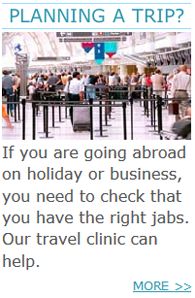 If you require any vaccinations relating to foreign travel you need to make an appointment with the practice nurse to discuss your travel arrangements. This will include which countries and areas within countries that you are visiting to determine what vaccinations are required. Please indicate your destination(s) as precisely as possible. Before making an appointment, please download and return our travel assessment form at least 6-8 weeks prior to date of travel. If you are travelling within 8 weeks and have not completed your travel assessment form, we will be unable to accommodate you. Please attend a private travel clinic. Some travel vaccines are ordered on a private prescription and these incur a charge over and above the normal prescription charge. This is because not all travel vaccinations are included in the services provided by the NHS. Our current charges are set out below. 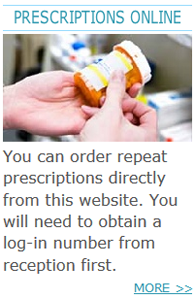 These are sometimes purchased from a Pharmacy or a private prescription is required (cost £14) and the Pharmacy will charge you for the tablets. Why do I need to complete the assessment form? This is so the Practice Nurse can give you important information for your trip, with regard to vaccinations and travel advice. It is very important to travel safely, with as much information as possible, for your health, safety and wellbeing. What happens once the form is completed? The Practice Nurse will check which vaccinations you will need and the type of information you require e.g. for altitude sickness, anti-malarial medication, bite prevention and much more. Who should complete an assessment form? Everyone travelling abroad, from small children to the elderly, anyone who has travelled before or first time travellers. The information will be tailored to individual needs, place of travel and past and present medical history. Will the Nurse contact me to let me know she has received the form? Yes. You will receive a letter informing you of travel vaccination requirements. Why do I need to complete the form 8 weeks prior to my trip? Some vaccinations are required in doses of 3, such as rabies and Hepatits B. Yellow fever, if required, is needed 10 days prior to travel, so it is sometimes time-restricted as to which vaccinations can be given.